Mojo’s has morphed into “The Hill’s Pizza and Dessert.” So what’s the verdict? All in all a good experience, although per usual I do have some picky little comments. But first the good stuff. 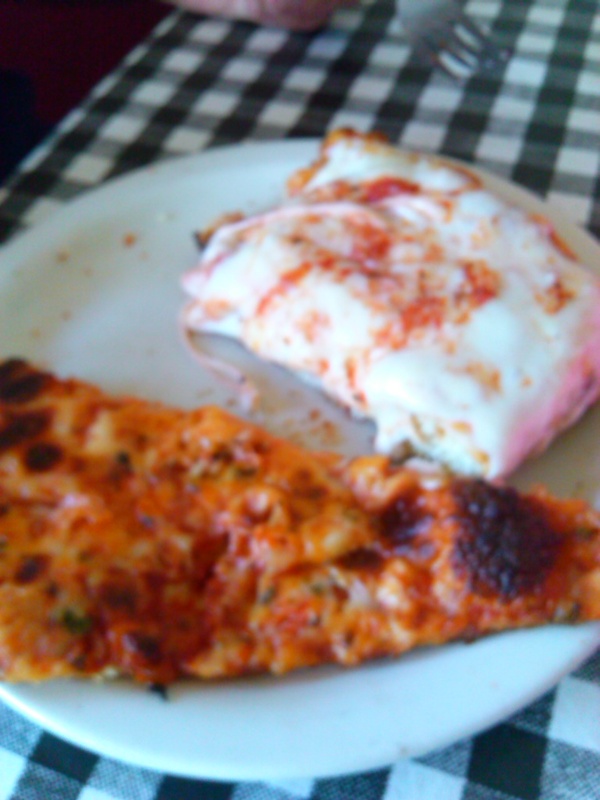 We ordered a slice each of Neapolitan and Sicilian pizza, just plain, no extra toppings. Then split an order of lasagna which comes with house salad and bread. Ordering pizza by the slice is risky. If the pizza is fresh out of the oven it can be sublime but if it has to wait under heat lamps — not so much. The thin crust of the Neapolitan pizza was crispy with a slight scent of yeast. The homemade sauce made from imported canned tomatoes from New Jersey was lightly seasoned with herbs and garlic but not so much it overpowered the flavor. Just enough cheese made this a pizza I would return for. The Sicilian pizza? Well you have to like a thick crust nearly an inch thick. I prefer pizza with a thinner crust. It was served hot with the cheese all gooey — that’s a technical chef term — and melty. Sicilian pizza is baked in a square pan while Neapolitan is round, but I bet you already knew that. Now onto the lasagna. I make lasagna from scratch — including the ricotta. It’s more of a challenge than you might think. Not enough sauce and the top layer of noodles is leathery. Overcook the noodles and you’ve got cheese and tomato- flavored mush. 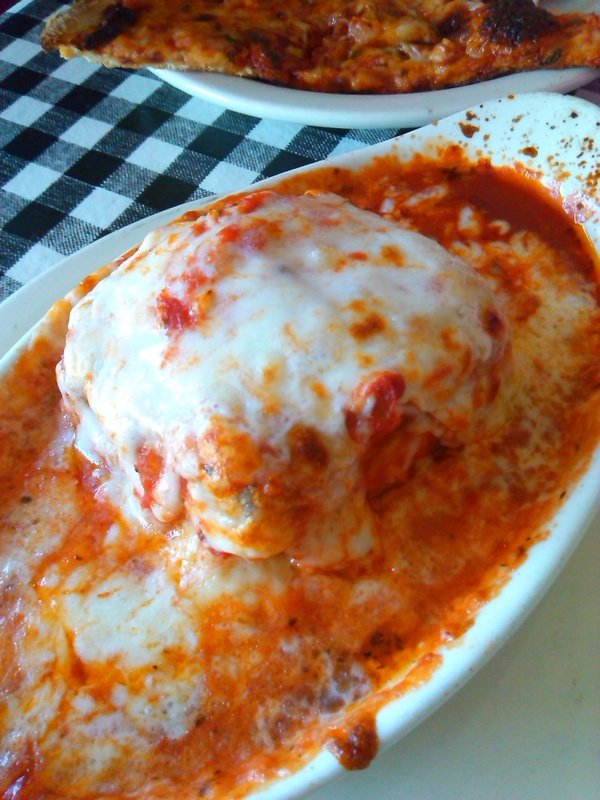 “The Hill’s Pizza and Dessert” lasagna sported layers of al dente pasta and rich ricotta cheese, smothered in tangy tomato sauce, and topped with more cheese. What I liked was the lasagna was served in a boat-shaped bowl so there was lots of sauce for dipping the bread. I give it 4 1/2 stars out of 5. The salad was okay. 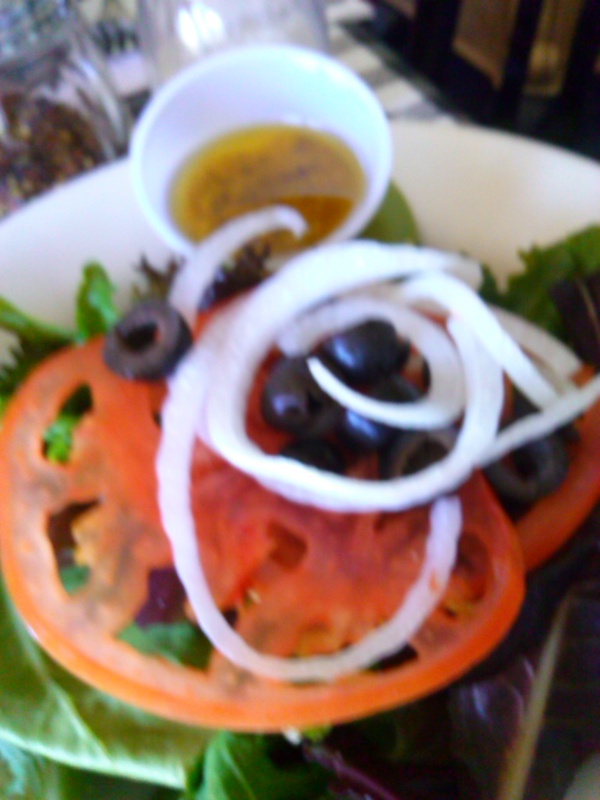 Fresh greens with a slice of tomato, onion and sprinkled with black olives. I would have preferred the salad greens torn into smaller pieces because it was a challenge chasing them around the plate as I tried to spear them onto my fork. A few leaves landed on the table, rather than my fork. The Italian dressing was homemade and served on the side. I would have liked to have seen maybe some cucumbers, yellow peppers or even some grated carrots to give the salad some color contrast. I know, I know, picky. Another suggestion, grated parmesan rather than the kind served in the shaker would have been nice. I’ll be returning for the spaghetti and meatballs. 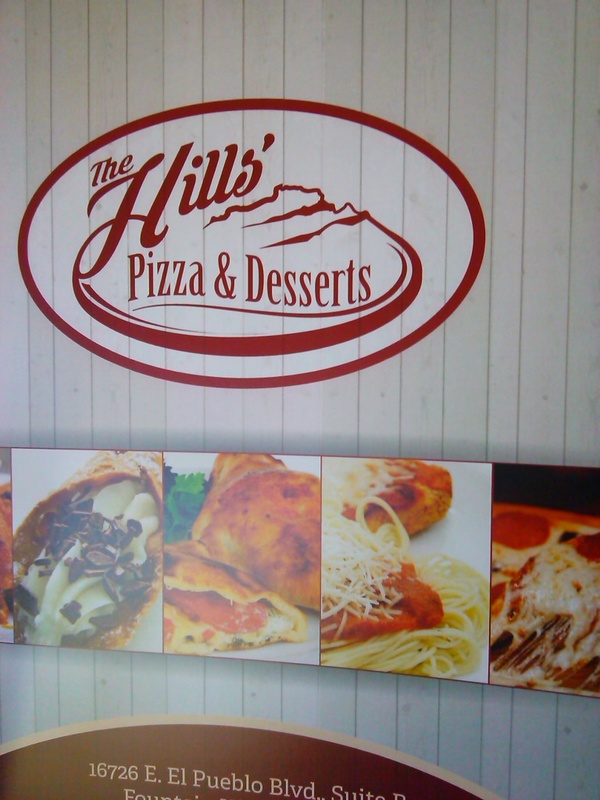 It’s rare to find a restaurant that makes meatballs with ground veal, pork and beef, but “The Hill’s Pizza and Dessert” does. The décor is modern with an old fashioned twist. For example, instead of the expected red-checkered table clothes, these were black-checkered table clothes. There is a small dining area separated by a 4 foot high wall that would be perfect for a group. Service was friendly and efficient, especially Vinny. Jimmy answered our questions — well mostly my questions — and took our order promptly. The owners, Ken and Valerie, went out of their way to check to see if we were having a good time. Here’s another effort that impressed me. Ken was out actually delivering the pizzas. 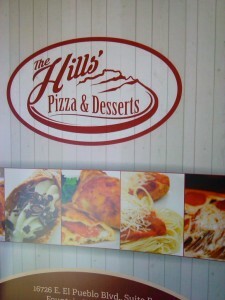 If you haven’t been to Mojo’s now “The Hill’s Pizza and Dessert” come in and try it. You’ll like it. Located at 16726 E El Pueblo Blvd. Fountain Hills AZ … 480 816 6656. As usual this review is posted on my personal FB page and on our blog if you would like to share with friends not in this group or FB.